Metropolitan modern curtain rod corner elbow. Finish: Brushed nickel. Use with tab top curtains, eyelet curtains or pinch pleat draperies. Adjust from 90 to 180 degrees. Use with tab top curtains, eyelet curtains or pinch pleat draperies. 6 foot smooth 1 inch metal curtain rod. Metropolitan modern curtain rod look. Here we are going to add the components neccessary to do a bay window with three sections. Select rod size from from 4', 6' or 8' lengths. Enter the size you want us to cut in the text box. Next, add two corner elbows to connect the rods between each angle in the window. Elbow pushes into the end of the two rods meeting in the corners of the window angles. Elbow adjust from 90 degrees to 180 degrees to match the angle of your window. Adjust to match angle and tighten the set screw. 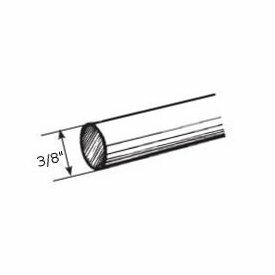 Corner elbow for 1 inch metal curtain rods 3 5/8 inches long by 1 5/8 inches wide. Connect two rods together for corner window or bay windows. Some colors are more than base price. Stock Colors: Black, Antique Gold, Rust. Next, determine which bracket style you would like from wall mount or ceiling mount. For sections over 6 feet, you will need one bracket foe each four feet. Plain standard rings for Valencia 1" curtain rod pole. Some colors are more than base price. Stock Colors: Black, Antique Gold, Rust. Go to site for large selection of rod styles, bracket types and ring and finials selection. Light gray finish end cap for 9046 track. Zinc plated metal for long lasting service in high volume installations. For grommeted cubicle curtains or hand draw, pinch pleated draperies. White finish. For grommeted cubicle curtains or hand draw, ripplefold draperies. Architrac Series 9046. Use with Ripplefold tape 92145-1. White finish. For grommeted cubicle curtains or hand draw, ripplefold draperies. Architrac Series 9046, 94003, 94004 and 94008 drapery tracks. White finish fiberglass. For grommeted cubicle curtains or hand draw, pinch pleated draperies. Note: Harness snap in image not included. 1 3/8" Double bracket that coordinates with designer metal curtain rod poles. This bracket is used to create a double layered drapery treatment. You can arrange a sheer curtain in back with an insulating drapery in front, or any combination you can imagine.